Charlie (aka CB2) mentioned in a recent post that his riding buddies call riding in frosty conditions, Whore Frost, well the whores were certainly frosty at Collis P Huntington State Park today. Frost heaves and icy conditions were definitely in abundance. The snow from the night before has all but melted making some rocky surfaces wet and others a little slick. Still, temperatures in the upper 30s, maybe it even hit 40, made for really nice riding. As luck would have it, the opportunity to take the Qball down to Trumbull wasn't in the cards today so I opted for the Dillinger instead of doing a repeat and it was a good choice. 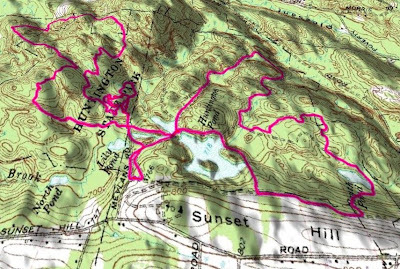 I rode in the Big Burn, hitting all the big rollers and spending a little more time in there than I wanted while looking for a trail that I didn't find, again, and then it was over to the single track that heads to north section of the park. Last week I went south towards the Vomits but on Saturday I turned north for the single track that makes a real nice DH run. By this time I took off my thermal layer which was just too hot. Coming down that DH run I cooled off and it got chilly but the long climb back up changed all that. I headed up the lollipop trail and happened notice that it looked like someone tried to drive a truck up the trail. Seemed kind of crazy. Heading back towards the ponds I took a trail that I haven't ridden in at least 5 years. Nice technical climb that ends up in some hike-a-bike both on the final ascent and the initial descent but pops you out onto the red trail after a little bridge. From there I headed up the red trail and came cross two guys riding GTs trying to be clandestine at the start of the Chimney Trail but who are you fooling? Everyone knows the trail is there, even the Land Manager. 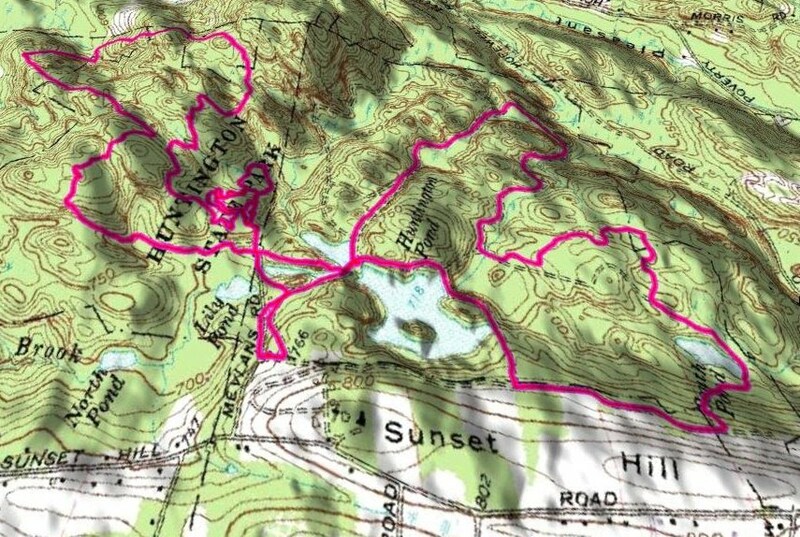 I rode over the to the Blue Trail that goes to South Pond and had great time flying down that single track. Noticed that someone re-armored the lower section of the trail. From there, I hit the single track off the white trail and finished the ride with a final loop on the red trail.